This letter was written by Francis (“Frank”) [R. or K.] Bailey (1836-19xx) of Middleville, Herkimer County, New York. Frank enlisted at age 24 in April 1861 as a private in Co. F, 34th New York Infantry to serve two years. He was promoted to a corporal during his service and mustered out with the company in June 1863 at Albany. Frank was a blacksmith in 1855 when he lived in Middleville with his brother. He later took up the carpentry trade. 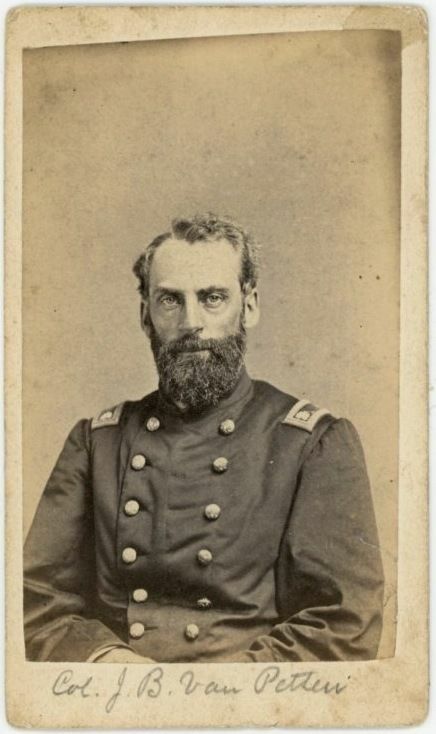 John Bullock Van Patten signed on as chaplain of the 34th New York. He wrote several letters to the editor of a hometown paper chronicling the movements of the regiment. Frank wrote the letter to his brother, Alonzo Eton Bailey (1824-1892), a wagonmaker in Middleville, Herkimer County, New York. 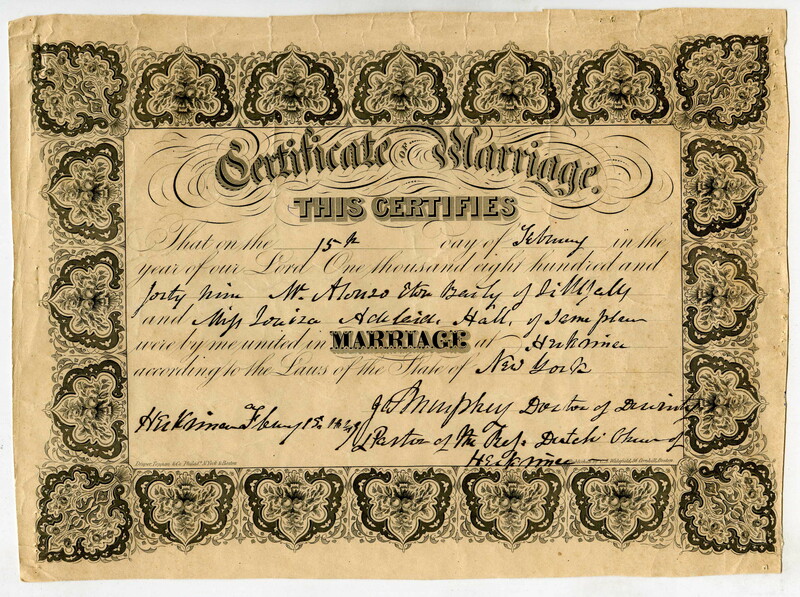 Alonzo was married to Louisa Adelaide Hall (1826-Aft1880) in February 1849 at Herkimer Falls. She was the daughter of Loren S. Hall (1801-1891) and Louisa Gertrude Ward (1801-1880) of Madison County, New York. I have not been able to learn the identity of Frank and Alonzo’s parents. Census records indicate their father was born in New Hampshire and their mother in New York (assuming they had the same parents). I also can’t be certain of Frank’s whereabouts after the war but I know he was discharged from the 34th New York at the end of two years without injuries and in good health. I believe he is the same Frank Bailey that resided in Dundee Village, Yates County, New York in 1900 where he is enumerated as a boarder in the Charles Smith household. This Frank Bailey’s census profile seems to match; his birthdate is given as June 1835, and he was still single in 1900. As we are about to leave here, I thought I would let you know it. We start tomorrow morning for someplace unknown to me yet. I am well as can be expected and so is the rest of the boys, and we all feel anxious to go, yet I don’t believe we shall get so good a place as this again for water and other conveniences. I said that we were all anxious to go. I will take that back for our Captain [Charles Riley] is gone to Herkimer [New York] to get new recruits to fill our regiment to a 1,000 men, so we hate to go without him. If there is any of them up there that wanted to go so fast last winter, now is their time. Tell Hen Sheldon and Jim Keno to be sure and come for me. They will like it, I know, and I should be glad to see them here. There is nothing new here unless it is that there is a man here that has set up a grocery here on tick. He lets the boys have things to eat and takes it out of their wages. He takes their name and gives them 3-5 and 10 cts tickets to pass. They can’t trade only $3.75 per month. His prices are low — he only charges 30 cts per lb. for butter and 16 cts for cheese, 5 cts for 3 cts papers tobacco and everything to match. The boys take them and play bluff [poker] with them. We call them shin plasters here. Amos showed me a letter from his folks the other day which stated that Louisa had wrote to them that there was 14 of our boys were shot while bathing and his mother wanted I should write to you and let you know whether it was so or not. My answer is no, no, no. I don’t know how you get such news up there. I ought to know too for I have lived there long enough for that. I should think if Middleville can’t get news, where can they? Dan ² got a letter yesterday from home and it said that he was out of money and if he wanted anything, his father would send him $10, but he wants you to tell his father that he is all right and not broke yet. He sends his love to you and all the rest. Adam Robbins ³ send his respects to you all. Don’t forget to tell them boys to enlist. When we get our destination, I will write if the Lord permits. Give my respects to all that takes an interest in my welfare. Tell Riley Wait he can come now for he can have a rifle. I wish he would and Griff Jones too. No more now. Take care of yourselves for me. ¹ Probably Amos B. Adams of Co. G, 34th New York Infantry. He enlisted at Herkimer in May 1861 at age 22. ² Probably Daniel Mangan of Middleville who enlisted with Frank in May 1861 at age 21 in Co. F, 34th New York Infantry. ³ Adam Robbins [or Rubbins] enlisted at age 30 in May 1861 at Herkimer to serve two years as a private in Co. G., 34th New York Infantry. He mustered out with the company at Albany in June 1863.